Now that I have recuperated from the trauma of car buying and am tooling around happily in my beautiful new (for me) automobile and impressing the neighbors — a bit like Toad, only better-behaved (extra points if you get the reference) — a host of other little things are making life challenging. You know, unexpected meetings (note the use of the plural – not one, not two, but many! ); unexpected need to write recommendations; unexpected oily messes from poorly shut jars of sun-dried tomatoes that somehow tipped over in the fridge at 11 p.m. after one of those unexpected meetings; unexpected armies of black ants marching through the bedroom, bathroom and kitchen; just unexpected stuff that keeps popping up in the middle of attempting to actually finish something, just one thing, for the love of God! So I am swamped and overwhelmed, but none of it is bad or life-threatening, and even though I haven’t kept you informed, we are still eating real food over here (and I am still washing heaps of real dishes, which is becoming a real problem because I have fisherman’s cracked hands). So, I’ll count my blessings and try to catch you up on some recent favorites. 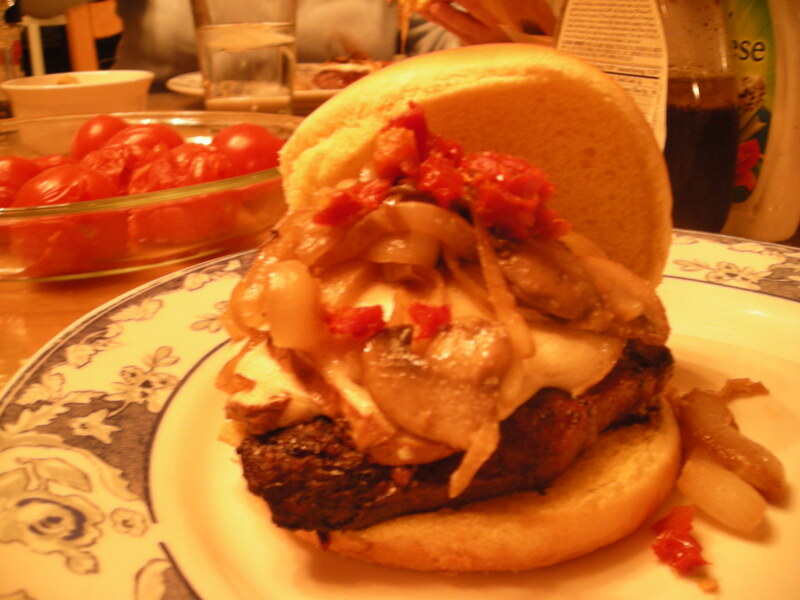 I promised you this burger topper recipe weeks ago, from a mid-winter BBQ with Marianne & Co. when the weather was mild enough to warrant firing up the grill. It is still mild enough! 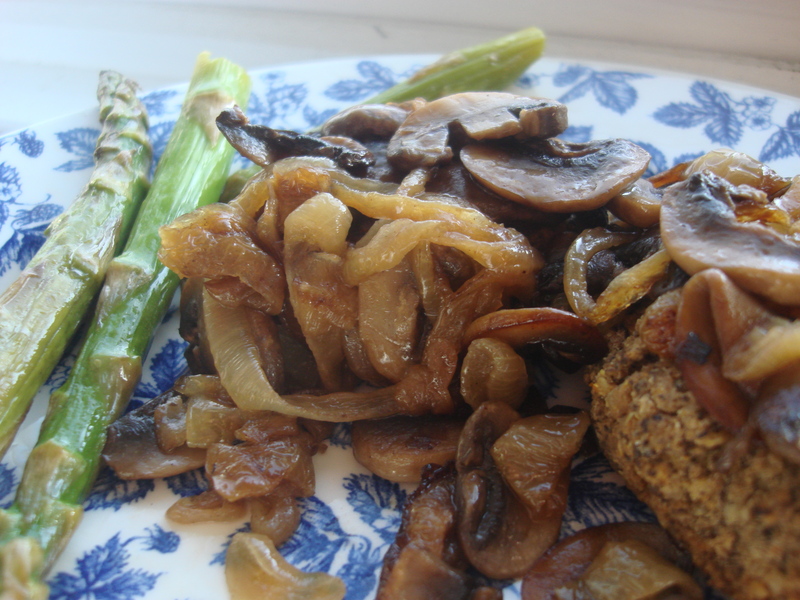 I have since made it to dress-up black bean burgers – it really made me feel as though I was having a restaurant meal. And I needed that. Melt 1 tablespoon of the butter in a skillet on medium-high. When foaming subsides, add onions to skillet, stir to cover and lower heat. Allow to wilt and caramelize (at least five minutes; more if you have the time). When onions have cooked and browned, remove and set aside. 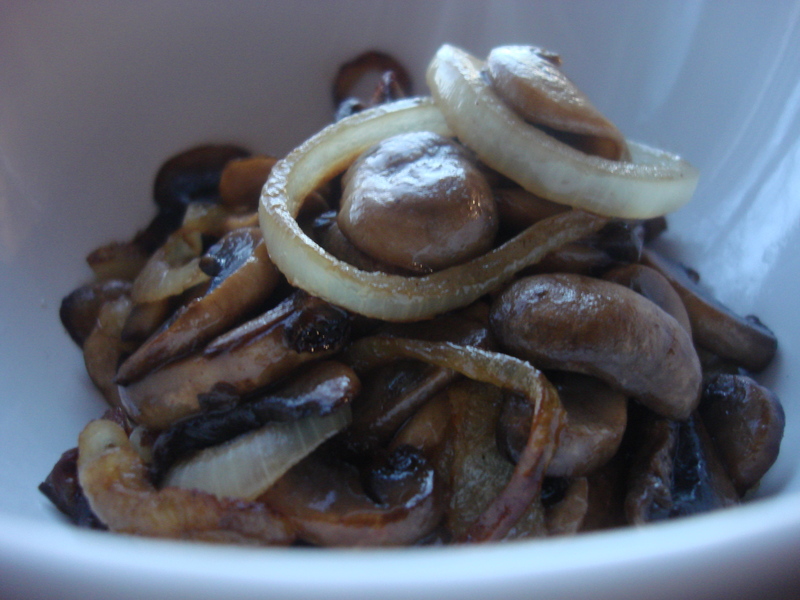 Add mushrooms to skillet with existing butter (add more if desired) and cook at medium –high, stirring occasionally, until mushrooms have released their liquid (about five minutes), liquid has evaporated somewhat and mushrooms are tender and browned. Add more butter, if desired (I desire a lot of butter! ), return onions to skillet and stir to incorporate. Add Worcestershire sauce to taste as desired, a teaspoon or so at a time. Serve atop cooked burgers, grilled meats or vegetable or veggie/bean burgers. Number One post on this blog! yaay!! I got the extra points! 😀 didn’t know it till I started researching it that it is actually a VERY popular topping the world over. i thought i was the only one who liked it! *rolling eyes*. It lousy in Boston too, very muggy! Looks terrific! I like to add hot sauce. Sorry about the sun-dried tomato trauma. LOVE sriracha but I often just add crushed peppers. Mmmmm. I have several pots of sweet and hot peppers growing…but the weather has been rather uncooperative…don’t know how well we’ll do…. NOTE TO READERS: THIS IS Hot, Cheap & Easy’s all-time most searched-for post….you NEED THIS RECIPE for your next grill-up! Efectivamente, esta receta es un must para esta temporada. Muy refrescante…Gracias por lo visita! Love sauteed onions and mushrooms, I have a photo sitting on my camera waiting for a Food post, but first is my venture into Corned Beef and cabbage, so the onions have to wait. um! Looking forward to seeing the results! I tried Burt’s Bees Fisherman’s Friend at work (I’m a college lecturer)…ended up greasing the whiteboard and the keyboard and getting greasy black marker smears EVERYWHERE…it’s great stuff, but only if you are going to stuff your hands in socks and go to bed.! That is a very intriguing substitution! thanks for stopping by! “That is NOT my button!” exclaimed Toad.